Humphrey Marsh was baptised at Highworth, Wiltshire, on the 16th April 1663, the son of Robert and Mary Marsh. He had an older brother, Robert, born in 1655 and a younger brother, Richard, born in 1669. His father, Robert Marsh senior, had been married at Highworth on the 14th October 1652 to Mary Hayward. Robert himself had been born at Highworth, the son of another Humphrey Marsh, a cordwainer, which means that Humphrey the clockmaker was named after his grandfather. Humphrey the clockmaker was married to Elizabeth at an unknown location about 1683 or 1684. At least we assume he was married as the marriage has not yet been traced. By chance I found that in July 1684 a Humphrey Marsh, son of Robert Marsh of Highworth, Wiltshire, a weaver, was apprenticed in London in the Bowyers' Company to Thomas Bedford. The trade the youngster learned was by no means necessarily the same as the name of the City Company, and there were often family reasons why a child would be apprenticed under a company, or the master belong to one, which had no apparent connection to the trade he practised. At this period an apprentice was almost always fourteen years old. Could there have been two Humphrey Marshes in Highworth, each with a father named Robert, one born in 1663 and the other about 1670? Or was this our Humphrey Marsh, who was apprenticed at the age of twenty one, which was possible but most unusual. Moreover he was already a married man (we assume!) in September 1684 when his wife gave birth to a son named Richard - only two months after he was bound apprentice. An apprentice was not allowed to marry until he had finished his term. Did Humphrey marry and break his conditions almost at once, thereby having his apprenticeship terminated? It remains a puzzle. Those who were apprenticed at a greater age than fourteen, even as late as perhaps twenty one, tended to be the children of wealthy parents, who could afford to let them finish their schooling before having them take up a trade. 1. A lantern clock by Humphrey Marsh, this one numbered 110. The frame is very different from that of number 105, but resembles that of the 1690 clock. He and Elizabeth had a son, Richard, baptised in September 1684 and a daughter, Elizabeth, baptised on the 19th March 1685/86. There was then a gap of about eleven years until a son, with the very strange name of Ono, was baptised there on the 26th July 1696. Ono seems to have been a nickname for John, perhaps derived from the abbreviation 'Jno.'. When I first came across this name some years back I thought it must be someone's misreading of Jno., but several documents relating to him later in life do write his name this way, and he even signed his will O. Marsh for Ono. I still cannot fathom how this name came about unless from a drunken vicar reading out a badly-written baptismal name 'Jno.' as 'Ono'. Anyway Ono stuck. Although I greatly enjoy the genealogical research involved in tracing the history of clockmakers, it is always a bit if a hit-and-miss affair. Success often depends on luck and all kind of chance circumstances - whether certain records survive for the years that matter in your search, whether the clerk made a slip writing down a name, whether an event took place at an unexpected location, whether events recorded in a similar name pertain to your quarry or not, and so on. Parish registers are often a vital source, but they too have their problems. Very often the parish clerk or vicar would jot down a note of baptisms, marriages and burials on a scrap of paper and enter them up neatly into the register proper once a week, or maybe once a month - provided he found the scrap of paper before it was discarded as rubbish. Some were immaculate record keepers, but most were not. This meant that entries were sometimes missed or wrong names written down in error during copying. So even apparently well-kept parish registers are not totally reliable. The tip that shows of the family iceberg offers us tantalising glimpses of random events we may guess relate to our quarry, whilst the great mass of events of his life remain hidden for ever beneath the surface of the genealogical sea. 2. This clock, number 110, has exactly the same engraved dial pattern as 105. In the winter of 1717 to 1718 Humphrey Marsh had an accident, evidently a serious fall. He made his will, on January 8th 1718, describing himself as an ironmonger, 'being indisposed by a fall'. This sounds like something much more than a tumble in the street. I have never known such a phrase set out before in a will. It implies he was otherwise in good health, but it seems that he regarded this fall as cause enough to write down his last will and testament - and he was right. I cannot help wondering if it resulted from his working on a church clock, and I dread to think of him clambering about the icy stonework of a church tower in mid winter and the bone-crunching result that could follow from a fall. Those who worked on church clocks might have regarded a fall as a hazard of the job, but this must have been a very serious one. Whatever was the cause, he never recovered from it and he died only a matter of days after and was buried on the 12th January. His will was proved on the 29th May 1718. He signed the will with initials H M, written in a very uncertain hand, alongside which the clerk has penned 'the mark of Humphry Marsh'. A man with these skills must have been able to write his own name. Interestingly a map survives in the Wiltshire Archives, a map of the "field between Byde mill brook and Westrop field, Highworth, measured by Humph. Marsh, 1713" - a further implication of a man with some learning and the likely ability to write. Clearly his feeble signature was the result of his terrible accident. He was fifty four. 3. The top plate of clock number 110 showing the re-instated verge escapement. 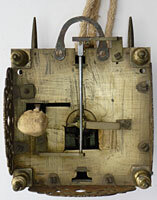 Humphrey Marsh made a variety of clocks, including turret clocks, one of which John Young documents as being made in 1703 for the stable block of Compton House at Compton Chamberlayne. He made longcase clocks and lantern clocks, only four of the latter having been so far documented. His earliest lantern clock I know of is un-numbered but is dated on a part of the dial hidden behind the chapter ring 18th December 1690. Other lantern clocks are known numbered 105 (dated 12th April 1700) and 110, which was made presumably only shortly after number 105 and has the exact same dial centre pattern of engraving as 105, and yet is not dated at all . A fourth clock documented, apparently the latest of the four, is not numbered. Why date two and not the other two? Why number two and not the other two? We will never know. 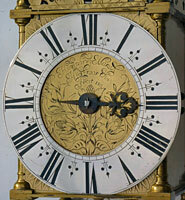 Longcase clocks are known numbered 118 and 209, and another, a fine early eight-day example, without a number. So again it looks as if he did not hit upon the idea of numbering from the start of his career, but after he was some years into clockmaking. At least one posted movement longcase I have seen has a lantern-type movement. From the above numbering it would appear that he did not number his earliest clocks, began numbering before 1700, but later perhaps stopped bothering to number them? Or is this really far too small a sample to form any serious judgement? 4. This left view of the movement of number 110 shows the wheelwork and the finely filed and chiselled hammer spring and hammer stop. We know a clockmaker working alone could produce 25 clocks a year, roughly one every two weeks, always supposing he had orders for so many. But as Humphrey saw himself principally as an ironmonger, we do not know what proportion of his time was spent on making clocks, nor whether he employed any workmen as assistants and if so, how many. As more examples are documented we may eventually be able to work out a grid of years relative to numbers. For now our knowledge of Humphrey Marsh and his work is in its infancy, but it is a start. An extended version of this article appears in Clocks Magazine.